Create baseboards, moldings, doors, window, and furniture from scratch with our selection of stripwood & sheetwood. With your imagination and wheels turning you will find many uses for stripwood. 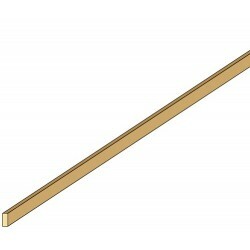 Redecorate and redesign your dollhouse with this 0.040x5/64x22 Basswood. Your decor and collection of miniatures will be taken to another level of fabulosity. 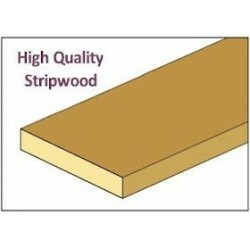 You will love this &NE173: STRIPWOOD, 3/64 X 1/2 as it complements your other miniature dollhouse furnishings. Now is the time to design a great new look! Adding this &CLA77189: STRIPWOOD, 1/16 X 3/8 to your miniature collection is just what you need to make your dollhouse a home, and showcase your fabulous taste. You will love this 1/16" x 1/2" x 24" Basswood as it complements your other miniature dollhouse furnishings. Now is the time to design a great new look! Adding this 1/16" x 1/8" x 24" Basswood to your miniature collection is just what you need to make your dollhouse a home, and showcase your fabulous taste. You will love this &CLA73222: STRIPWOOD, 3/32 X 3/8 as it complements your other miniature dollhouse furnishings. Now is the time to design a great new look! Enhance your dollhouse collection with this 1/8" x 1/2" x 24" Basswood. Added to your other dollhouse miniatures, it is a complement for a variety of styles and tastes. You will love this 1/16" x 1/4" x 24" Basswood as it complements your other miniature dollhouse furnishings. Now is the time to design a great new look! Adding this &CLA77187: STRIPWOOD, 1/16 X 1/4 to your miniature collection is just what you need to make your dollhouse a home, and showcase your fabulous taste. You will love this 1/16" x 4" x 24" Basswood as it complements your other miniature dollhouse furnishings. Now is the time to design a great new look! Adding this &CLA73183: STRIPWOOD, 1/16 X 1/8 to your miniature collection is just what you need to make your dollhouse a home, and showcase your fabulous taste. You will love this 1/32x5/64x22 BASSWOOD as it complements your other miniature dollhouse furnishings. Now is the time to design a great new look! 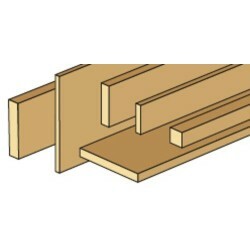 Enhance your dollhouse collection with this &CLA73240: STRIPWOOD, 1/8 X 3/4. Added to your other dollhouse miniatures, it is a complement for a variety of styles and tastes. You will love this &CLA77132: STRIPWOOD, 1/32 X 3/8 as it complements your other miniature dollhouse furnishings. Now is the time to design a great new look! Adding this &NE70162: STRIPWOOD, 3/64 X 1/16 to your miniature collection is just what you need to make your dollhouse a home, and showcase your fabulous taste. You will love this 1/16" x 3" x 24" Basswood as it complements your other miniature dollhouse furnishings. Now is the time to design a great new look! Adding this &CLA77237: STRIPWOOD, 1/8 X 3/8 to your miniature collection is just what you need to make your dollhouse a home, and showcase your fabulous taste. Spruce up your dollhouse with this miniature &NE70201: STRIPWOOD, 5/64 X 5/32. We have many miniature Stripwood/Sheetwoods for that finishing touch.